Your crawl space waterproofing system plays an important role in your home by protecting you from groundwater seepage. Having a specialist stop by to check on your sump pump, crawl space drainage, and other components of your system, will find any potential problems before they find you! 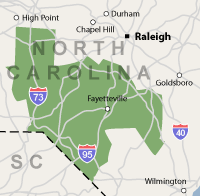 We service our existing systems in North Carolina, including Fayetteville, Sanford, Asheboro and nearby. Check For Problems & Suggest Upgrades: Often, our service technician will see signs of newly emerging problems that may not have existed before and they can suggest and/or implement solutions that will address these issues proactively. We're always expanding our product line to help keep your crawl space dry! Unfortunately, the answer to that question is "After your pump has failed and your crawl space is wet". A wet crawl space is far from "free"! The ideal decision is to find the most reliable crawl space waterproofer in your area -- one who installs a high-quality system and battery backup. The company should provide annual maintenance, helping you to keep the crawl space dry all the time!